Autumn is in full swing and the long dark nights are finally upon us! Although undeniably cosy, the longer nights can leave your home vulnerable. In fact, on average, home burglaries actually increase during October, November and December after the clocks go back. At B&K Timber however we have the perfect solution, our bespoke driveway gates which will not only protect your home from potential intruders but will also enhance the exterior of your property! Bespoke driveway gates from B&K Timber are an increasingly popular addition to many homes across the UK due to their ability to add a level of security and privacy to any home. The solid timber structures can deter criminals whilst also being a stylish addition to your home! The Driveway Thurlwood Gate is a perfect example with its solid yet grand apex. 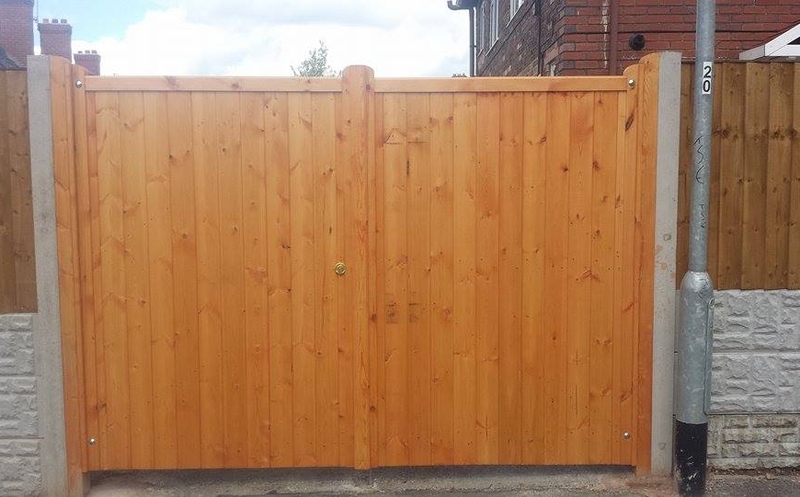 In addition to being stylish, our bespoke driveway gates are also incredibly durable as they are treated with a spirit based wood preservative which delivers long lasting protection against the elements for many years! Here at B&K Timber, we are experts when it comes to bespoke driveway gates as we have been crafting them for over thirty years now. We use only the best sustainable Scandinavian timber which is PEFC and FSC certified, so you can rest assured that you will be investing in a quality product which is built to last. Order Bespoke Driveway Gates Today! Ordering bespoke driveway gates has never been easier, simply visit our online garden gate builder to begin! From here you will be able to choose a driveway gate to suit your budget and style before being asked to provide your measurements. To help you along the way we have also provided a helpful measuring guide. If you do however require more information or you have any questions about our bespoke driveway gates, then please do not hesitate to contact a member of our team today!